Marc is the fifth generation butcher. 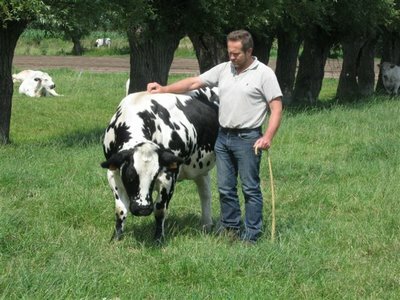 But as family tradition defines not only do they sell the meat, they also breed their own cows. 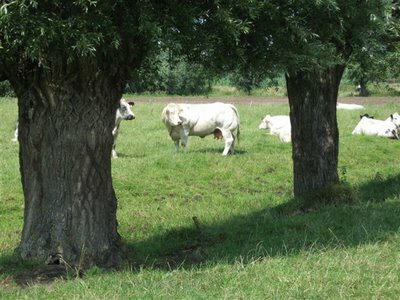 After starting with different breeds and types, nowadays, they breed almost exclusively Belgian White Blue cattle (Witblauw fokkerij). This race is healthy, rustic, heavy-muscled, big, large and especially tall. Marc has a very specific philosophy about breeding. The cows he slaughters have calved up to 5 times. His cows are fattened up very slowly. All his cows are cows that have lived, they have given birth, they have fed calves, they have been skinny, and they have been through rain and wind… They produce meat with character; you can taste their lives in the meat. And it’s not because they are old and lived through that they are chewy. Genetics determine their tenderness. 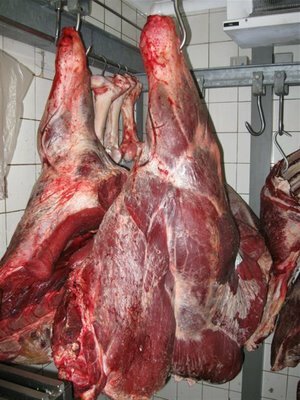 By being very selective and specific on the genetic part, Marc knows for sure that his meat is tender, it has a fine muscle fiber structure and is low in fat. He works with a pedigree record. After birth, the calve stays with its mother for the first couple of days. Next, the calves walk around freely in the stable. Marc educates his calves stress free. They have to be able to do what they want, go where they want and eat what they want. During the first three months not only are they nursed, they also get the opportunity to snack and nibble adult food. This stress free environment adds tender taste to the meat. At the farm Marc receives help from his father in law and some locals. He works at the farm in the morning. The afternoons are spent in the shop. Spare time is filled up with farm work if needed. Especially calving period gives sleepless nights. 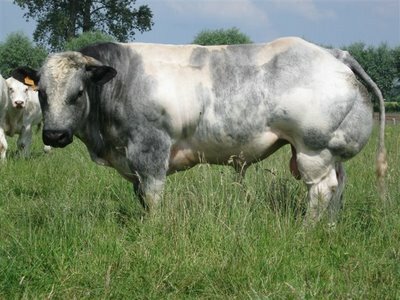 Because of the heavy musculature of the Belgian White Blue race; all calves are delivered through C-section. His wife Claudine keeps the unique charming shop running all year round. She greets everybody with warm enthusiasm no matter what the weather is like. Although when it gets to cold there might be a whisky or jenever available for those standing in line. I will give you a recipe that rejoices this super meat in all its excellence! Jamie Oliver is once more the man I turn to for this idea. This Carpaccio is nothing like the ordinary Carpaccio that is being served on every corner of the street these days. 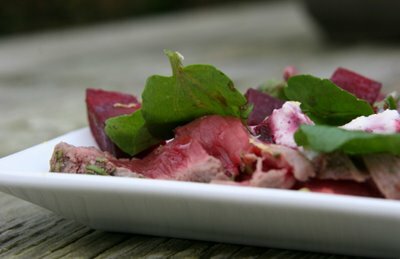 A unique combination of red beets, horseradish and watercress are pleasing to eyes and taste buds. Plus I guarantee you this is the most loved party food. Serve on big plates. Let your guests be adventurous and sensual and let them pick at this wonderful dish with their hands. Even the most stiff, tightened up invitees will melt, loosen up and tuck in. But be aware this dish should only be served with the highest quality beef. I would encourage you to go out their and look beyond supermarkets, look through hormone jammed artificial meat and discover that special authentic butcher in your neighborhood. Believe me when finding your holy grail of butchers, you will find a new joy of life in this crisis driven world. 1 kilogram fillet of beef high quality! Mix the rosemary salt and pepper on a board. Roll and press the fillet of beef over this, making sure all sticks to the meat. In a very hot pan, sear the meat until brown and slightly crisp on all sides, around 5 minutes (or less, we want it raw and juicy on the inside). Remove from the pan. Allow it to rest for 5 minutes, then slice it all up as thinly as you can. Lay the slices on a large plate. After preparing the beef, sprinkle the roasted beetroots randomly (whole, halved or quartered, depending on size) over the sliced meat. And don’t forget all that lovely juice drizzle it over the meat. Now mix the horseradish and creme fraiche together. Good pinch of salt, pepper and juice of half a lemon. It has to be seasoned well. Dribble this over the beetroots. Sprinkle some watercress, along with some small slivers of shaved Parmesan, all over the plate. Finish of with a dribble of olive oil on the top and get ready to tuck in! No worries mate, the salad ladies are here! We’re one of the lucky family’s that may eat every day from this delicious meat of Marcs farm. I really appreciate the little differences in taste from cow to cow. Its always nice to hear the story of the cow’s life and then taste “the character” on your plate. And beside the quality of the beef, there is the charm of Claudine and the typical butchershop. I’am so glad we still have this in Belgium. Next story The Hidden Glasshouse is on the move! Previous story Finally Full Monty!